In South Dakota, CREP focuses on improving water quality, reducing soil erosion, and providing flood control all while creating additional pheasant nesting habitat and pheasant hunting access in the James River Watershed. ABERDEEN, S.D. -- More than 75,000 acres are now enrolled in South Dakota’s Conservation Reserve Enhancement Program (CREP) along the state’s James River watershed. All these acres – which have been enrolled with the help of Pheasants Forever Farm Bill Biologists – are private lands that will be open to pheasant hunters. South Dakota’s general pheasant season opens this Saturday, October 19th. South Dakota’s pheasant population has fallen from a modern historic high in just a few years as a result of unfavorable weather and habitat loss. Weather played a role in the state’s pheasant decline, but habitat is the variable which concerned South Dakotans can focus on to reverse pheasant population declines. “Pheasant numbers can rebound in a big way if there’s a strong upland habitat base,” says Dave Nomsen, Pheasants Forever vice president of governmental affairs. “These CREP ‘walk-in’ areas exist on over 570 farms, which shows there’s still a strong conservation ethic in South Dakota’s pheasant country.” Seven of Pheasants Forever’s eight South Dakota Farm Bill Biologists are located in eastern South Dakota; the positions are thanks to Pheasants Forever’s unique partnership with the U.S. Department of Agriculture (USDA) and South Dakota Department of Game, Fish and Parks. Ultimately, the goal of South Dakota’s CREP is to enroll up to 100,000 acres of eligible agricultural land located in the James River watershed, but USDA’s authority to deliver CREP and other conservation programs has expired and is dependent on a new federal Farm Bill to continue. All CREP walk-in areas are open year round to public hunting and fishing access. 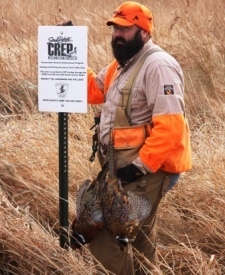 CREP lands are owned by private individuals who have enrolled them in the Conservation Reserve Program (CRP) and signed a lease agreement with South Dakota Department of Game, Fish and Parks to provide public hunting and fishing access. CREP areas can be located via South Dakota’s Hunting Atlas. Pheasants Forever Farm Bill Biologists are located in local USDA service centers in priority habitat areas throughout the pheasant range, including South Dakota. Farm Bill Biologists educate farmers and landowners about the benefits of conservation programs, such as CREP, as well as assist those farmers and landowners after programs have been implemented. For more information on Pheasants Forever in South Dakota, please contact Mike Stephenson, Pheasants Forever's South Dakota regional representative, at (605) 651-2716 or email Mike. Pheasants Forever, including its quail conservation division, Quail Forever, is the nation's largest nonprofit organization dedicated to upland habitat conservation. Pheasants Forever and Quail Forever have more than 135,000 members and 745 local chapters across the United States and Canada. Chapters are empowered to determine how 100 percent of their locally raised conservation funds are spent, the only national conservation organization that operates through this truly grassroots structure.